Ah, beautiful Arizona Wildflowers! Spring is the perfect time to enjoy them and rediscover their beauty. What is your favorite? It may be hard to choose just one as there are so many. I particularly love the Strawberry Hedgehogs! Their scientific name is known as Echinocereus Engelmannii. Forget the scientific name. If you know what these look like, you don't need to know what their scientific name is. You already know that their color is as bright as can be. Very bright fuchsia! They are usually found in groups and certainly more recognized when they are in bloom. The Strawberry Hedgehog is a commonly seen cactus here in the Sonoran desert and if you like bright colors as I do, you love them, too. Their flowers will generally last for several days. The fruit that it produces is sweet. Hence, many animals such as the birds, surely enjoy their sweetness. The Strawberry Hedgehog cacti is an Arizona Wildflower which produces these beautiful flowers, prefer the rocky soil on any canyons, hillsides, and washes. They are found at elevations of 600 to 8,000 feet. There are approximately 6 different species of this plant. Below is a picture of a Strawberry Hedgehog flower that was taken at the Grand Canyon. You'll find these beautiful Hedgehogs in the central part of the state, as well as the northern part of Mexico. 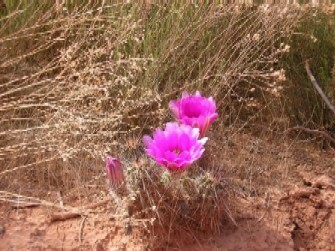 Here in the far east "valley of the sun," these wildflowers and others are pretty plentiful. At the time of this writing, which is mid-April, it is hard to remain inside doors when there is so much beauty just outside the front door. AZ Wildflowers are something you just never get tired of seeing. Here in Pinal County, you will find many Arizona Wildflowers while just driving around. I remember a few years ago in 2003, when the area was just lit up with flowers. We had a lot of spring rain that did it's part at giving what these wildflowers needed. Boy, did they ever come alive and bloom. I worked for Pinal County at that time and every day during that particular spring, I really enjoyed driving into work because I knew that I was going to get to see these beauties on my way to work, which meant I had to travel east of Gold Canyon to travel to Florence, Arizona. The whole area of the US Highway 60 looked more like "The Yellow Brook Road!" I could not believe how many poppies there were. I kept waiting to see Dorothy, Toto, and the rest of the gang to pop out from the side of the road. It was just beautiful. If you are looking to see a wide array of Arizona Wildflowers and plants all in one central location, you should check out the Boyce Thompson Arboretum State Park. The park is located in Superior, Arizona. This is located about 65 miles east of Phoenix, on US Highway 60. Here you will find so many plants and flowers; you will just be amazed at what you will see. I have visited the museum myself and really enjoyed the beauty. It definitely is a "must see" attraction. If you are short on time and want to see as many plants as you can, then this would be a great place to visit. It's been around for many years, in fact since the 1920's, so they must be doing something right. We will constantly be updating this and other pages on our site. We will certainly be adding more species of wildflowers for your reference. Please be patient and bookmark this site and come back real soon.